El tema nace de La Eneida de Virgilio. Argumento al final. Vea también Calidades de voz. 2b. Chorus: "Banish sorrow, banish care"
3. Aria and Ritornello: "Ah! Belinda, I am prest with torment"
4. Duet: "Grief increases by concealing"
5. Chorus: "When monarchs unite"
6. Trio: "Whence could so much virtue spring?" and Chorus: "Fear no danger"
8. Trio: "See, your royal guest appears"
9. Chorus: "Cupid only throws the dart"
10. Aria: "If not for mine"
11. Prelude and Aria: "Pursue thy conquest, love"
12. Chorus: "To the hills and the vales"
14. Prelude and Aria: "Wayward sisters"
15. Chorus: "Harm's our delight"
16. Aria: "The Queen of Carthage, whom we hate"
17. Chorus: "Ho ho ho!" 18. Witches' Trio: "Ruin'd ere the set of sun"
19. Chorus: "Ho ho ho!" 20. "Witches' Duet - But ere we this perform"
21. Chorus: "In our deep vaulted cell"
22. "Echo dance of the furies"
24a. Aria: "Thanks to these lonesome vales"
24b. Chorus: "Thanks to these lonesome vales"
25a. Aria: "Oft she visits this lone mountain"
25b. Ritornello: "A Dance to entertain Aeneas by Dido's Women"
26. Aria: "Behold, upon my bended spear"
27. Aria and Chorus: "Haste, haste to town"
29. Chorus: "Come away, fellow sailors"
31. Trio: "See the flags and the streamers curling"
32. Aria: "Our next motion"
33. Chorus: "Destruction's our delight"
Trio: "See, madam where the Prince appears"
36. Chorus: "Great minds against themselves conspire"
37. Aria: "Thy hand Belinda, darkness shades me"
38. Ground, Aria and Ritornello: "When I am laid in earth"
39. Chorus: "With drooping wings"
40. Epilogue: "All that we know the angels do above"
Vea también las dificultades de Aprender de memoria la obra. 06:43 • Whence could so much virtue spring? 17- CHORUS Ho, ho, ho, ho, ho, ho! [etc. Opera live. 1 hora. Se filma todo. Virtudes y falls del directo. Interesante. Joris teatrito de bolsillo, montaje imaginativo. Desafinado. Fortune smiles and so should you. Grief should ne'er approach the fair. Our Carthage to secure and Troy revive. They triumph at once o'er their foes and their fate. What storms, what battles did he sing? How soft in peace, and yet how fierce in arms! How Godlike is the form he bears! With cares of love and state distrest? Fate forbids what you pursue. Aeneas has no fate but you! A hero fall, and Troy once more expire. Confess the flame her tongue denies. To the musical groves and the cool shady fountains. Go revel, ye Cupids, the day is your own. Of a mischief shall make all Carthage flame. Say, Beldam, say what's thy will. Harm's our delight and mischief all our skill. Depriv'd of fame, of life and love! Ruin'd ere the set of sun? Tell us, how shall this be done? The Queen and he are now in chase. Hark! Hark! the cry comes on apace. And charge him sail tonight with all his fleet away. Those did Venus' huntsman tear. Rends the mountain oaks a sunder. The Angry God will brook no longer stay. Tonight our anchors shall be weighed. But from her arms I'm forc'd to part. Obey your will, but with more ease could die. By the Nymphs of Carthage to please us. Come away, fellow sailors, your anchors be weighing. The Queen's forsook, ho, ho! Must be to storm her Lover on the Ocean! Elissa bleeds tonight, and Carthage flames tomorrow. Elissa dies tonight and Carthage flames tomorrow. To Earth and Heav'n I will complain! To Earth and Heav'n why do I call? Earth and Heav'n conspire my fall. As would convince you still he's true. What shall lost Aeneas do? The God's decree, and tell you we must part? By all that's good, no more! All that's good you have forswore. And let forsaken Dido die. In spite of Jove's command, I'll stay. I'm now resolv'd as well as you. The injur'd Dido's slighted flame. Let Jove say what he will: I'll stay! Away, away! No, no, away! No, no, I'll stay, and Love obey! La acción se desarrolla en Cartago, en época mitológica. fate your wishes does allow. yet would not have it guess'd. aunque no debiera ni suponerse. y a Troya para revivirla. their foes and their fate. what battles did he sing? I fear, I pity his too much. The opera opens with Dido in her court with her attendants. Belinda is trying to cheer up Dido, but Dido is full of sorrow, saying 'Peace and I are strangers grown'. Belinda believes the source of this grief to be the Trojan Aeneas, and suggests that Carthage's troubles could be resolved by a marriage between the two. Dido and Belinda talk for a time—Dido fears that her love will make her a weak monarch, but Belinda and the Second Woman reassure her that "The hero loves as well." 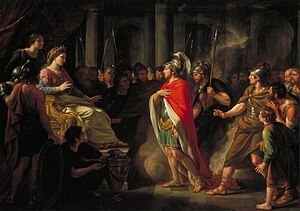 Aeneas enters the court, and is at first received coldly by Dido, but she eventually accepts his proposal of marriage. Dido and Belinda enter, shocked at Aeneas’ disappearance. Dido is distraught and Belinda comforts her. Suddenly Aeneas returns, but Dido is full of fear before Aeneas speaks, and his words only serve to confirm her suspicions. She derides his reasons for leaving, and even when Aeneas says he will defy the gods and not leave Carthage, Dido rejects him for having once thought of leaving her. After Dido forces Aeneas to leave, she states that "Death must come when he is gone." The opera and Dido's life both slowly come to a conclusion, as the Queen of Carthage sings her last aria, "When I am laid in Earth", also known as "Dido's Lament." The chorus and orchestra then conclude the opera once Dido is dead by ordering the "cupids to scatter roses on her tomb, soft and gentle as her heart. Keep here your watch, and never never never part." sus enemigos y su destino. qué batallas nos ha referido! con el encanto de Venus. así, qué fiero en las armas! can only cure the smart. recogidas en los emparrados Elíseos. y el peligro de los estados? el débil azote del destino. es la única que puede curar al dañado. and Troy once more expire. and the cool shady fountains. of love and of beauty be shown. the day is your own. y que Cartago expire una vez más. y a las frescas y umbrías fuentes. del amor y de la belleza. and mischief all our skill. Ho, ho, ho, ho, ho, ho! ¿dinos cuál es tu voluntad? y el mal nuestra habilidad. de vida y de amor! ¡Ja, ja, ja! ¡Ja, ja, ja! the cry comes on apace. with all his fleet away. El estruendo llega con prontitud. y reconducirlos a la corte. debería recurrir a estos bosques. from the storm can yield. will brook no longer stay. los robles de la montaña. ofrecer refugio de la tormenta. y restaurar a la arruinada Troya. Yours be the blame, ye gods! ¿Cómo puede ser tan duro un destino? de gozo, la siguiente de renuncia. dan brillo a falsas palabras. la reina ha sido abandonada. asaltar a su amante en el océano! y Cartago arderá en llamas mañana. el deleite nuestra mayor tristeza! y Cartago hervirá en llamas mañana. the authors of the fact. a la tierra y al cielo! a la tierra y al cielo? y contaros que debemos partir? los autores de sus actos. por todo lo que es bueno! ¡Fuera, fuera! ¡No, no, fuera! si más largo es tu aplazamiento. cuando él se haya ido. la muerte es ahora una visita bien recibida. dulces y tiernas como su corazón.